Azerbaijan is a part of the regional and global community and therefore, the solution and prevention of environmental challenges have not bypassed us; and this is quite natural, because the problems of ecology are relevant all over the world. Therefore, Azerbaijan also pursues an environmental policy, and if we are to compare the current phase with the period of 20 years ago, we will see that a great deal of attention has been paid to the solution of environmental problems, and particularly on the part of the country's leadership, which provides an opportunity to effectively resolve many problems. The improvement of water resources, the increase of forest areas and the conservation of biodiversity, among all, can be shown as an example. The Ministry of Ecology and Natural Resources of the Republic of Azerbaijan has been implementing large-scale projects to improve the environmental situation in the country. The current thematic exhibition is of immense importance. This is a very effective platform for sharing experiences, and negotiating, discussing and finding ways to resolve environmental problems. Today, the exchange of experience with different countries and companies is essential, as solving environmental problems is an ongoing process in which the adoption of successful experience is important. Moreover, the exhibition is a meeting point between various non-governmental organisations, the private sector and the scientific community. As a result, we can see a synthesis of ideas which can lead to an effective solution of the problem. 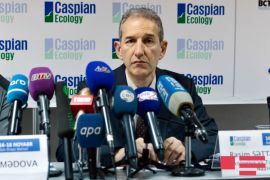 As is the tradition, the Caspian Ecology has become a major regional environmental forum and participation in this event is both important and useful. At the Caspian Ecology pavilions we became acquainted with the activity of a company from Israel, following which we implemented several projects to provide a number of settlements in the regions of the country with clean portable water. Effective forestry and landscaping projects - all are part of the projects where the experience gained at the exhibitions has been applied.